As part of our ongoing employee spotlight series, Fifteen4 will be profiling the employees in our office who inspire us. Today, meet Graphic Designer Kristen Mallory. Graphic designer Kristen Mallory builds narratives image by image. Anyone who chooses a career path in storytelling has heard “Show, don’t tell,” come from the mouths of professors, colleagues, editors, and mentors: Squeeze that page into a paragraph, that paragraph into a sentence, and that sentence into a word. Get the most from every part so that the whole is as strong as it can be. In storytelling, images can do the heavy lifting—especially when you’re (sigh) showing and not telling. 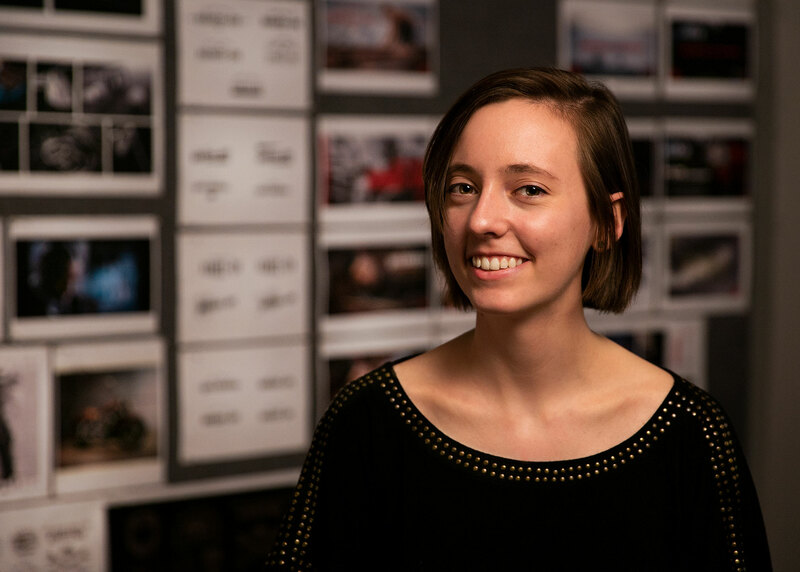 Fifteen4 graphic designer Kristen Mallory keeps that in mind on every project: Behind every image is the story of how it got there, pieced together by its components—its color, its shape, its placement, its contrast, its focus, its hue, its size. Everything has a role to play. What is the most important element that’s going to tell this story, even if it’s not obvious that it is a story? Like every image in her work, Kristen has a story behind her, as well. Homeschooled in Rockville, MD, she let an interest in drawing and painting since she was young lead her into a graphic design class in high school. Genre classics like Ender’s Game, Redwall, and the Chronicles of Narnia opened up vast worlds in front of her, through which traveled young star pilots and warrior mice. Each tale was a knot of narrative threads satisfyingly unwound by their ending; each character had a sweeping epic behind them. Spacefaring, sword-wielding, and wardrobe-entering narratives became a natural element of Kristen’s creativity. It’s helpful for me to have a creative outlet that’s a little bit different from design; I find that there are concepts that relate to both fields, even though they feel pretty disparate. Not every client allows for the opportunity to inject fantasy and sci-fi elements into her work, but that’s the point of being well-rounded: To stay motivated by your passion, wherever it’s being channeled. Every image tells a story. Or—if you’re telling it right—it’ll show it.